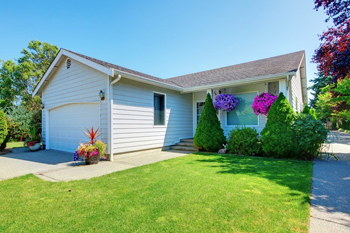 The color of garage doors play a very significant role to the aesthetics of the whole property but, in reality, the good quality coatings will protect their surface from erosion and elements. Water, moisture, extreme heat and freezing conditions may destroy most materials and create erosion or mildew. Painting may be time consuming, but it's not a hard procedure and it will actually make a huge difference to the appearance of the door and the entire house. Painting basically requires a good brush and the right powder coat, but it's good to know some small secrets before you start the whole procedure that will help you have better results. Choose the right season because you wouldn't want strong winds or storms destroying your hard efforts, leaves sticking on the freshly painted door or a sticky panel. You should prefer engaging on that task during the spring or summer days, when the sun will dry out the paint quickly. Hence, follow the weather predictions beforehand. Get “green” colors. Each material has its own specifications and requirements, but you can find excellent ecological paints in the market. Choose the color carefully. It's good to choose the proper shade that would match the house and it's always recommended to avoid intense colors, which may tire you after a short period of time. Don't start painting the door before you clean the surface well and dust the garage door parts. If the old painting starts peeling off, scrub it off yourself and remove the dirt with soap and water. Protect the mechanism from the paint. A few drops of paint on the garage door tracks would keep rollers from sliding properly and you would have to scrub the painting off. Don't apply the second hand before the first one is completely dry. You should apply coatings that will make the material resistant for the first hand. Painting is not only about looks, but protection of the garage door, too.